Nicolas Lodeiro scored what seemed to be a game-winner late against San Jose, but a defensive blunder in the final seconds cost Seattle two points on the road in a 1-1 draw. When Nicolas Lodeiro scored on a world-beater volley in the 84th minute, the Seattle Sounders looked certain to pick up their first road win of the season and second win ever on the road against the San Jose Earthquakes Saturday night. Six minutes later, Sounders-killer Chris Wondolowski slipped between five defenders and scored an equalizerl in the final seconds to salvage a draw for the hosts, 1-1. Sounders coach Brian Schmetzer was displeased with the late letup. Lodeiro’s goal was representative of a sloppy game that had 32 shots taken, but only six (three for each side) threatened the goal. The score began when Clint Dempsey won a free kick just outside San Jose’s penalty area, and subsequently smashed the free kick into Anibal Godoy in the wall. The rebound struck the ground and Lodeiro rushed to meet it, striking the ball with the outside of his left foot and sending it curling to the far left post, where it slipped past goalkeeper David Bingham. Wondolowski’s goal happened in part due to changes to the back line (1-1-3) that helped create space. Roman Torres went down off the ball early in the first half, leading to a substitution in the 15th minute of Gustav Svensson. Torres was diagnosed with a left hamstring strain. The other fateful change came in the 70th minute, when Schmetzer removed right back Oniel Fisher in favor of adding attacking midfielder Alvaro Fernandez. The move pushed defensive midfielder Cristian Roldan, named to the MLS Team of the Week after a strong performance in a draw against Atlanta United March 31, into Fisher’s spot on the back line. As the Sounders bunkered in the final minutes, the Earthquakes bore down, forcing Seattle into its defensive third and looking for a chance to sneak a ball past keeper Stefan Frei. The chance came in the final minute, when Marco Urena fought his way to the end line and swung a waist-high cross through three defenders as Wondolowski crashed toward the back post. The ball found Wondolowski unmarked. He converted into the open side of the net to rescue a point for his side. On the decisive cross, Svensson tracked too far back, while Roldan failed to mark Wondolowski’s run into the area. The goal was Wondolowski’s 11th against the Sounders. No other player in MLS history has scored more goals against Seattle. “I thought we were on top of them,” Schmetzer said. “We got the goal. We should have closed the game out. (Removing Fisher at right back) gives us a more attack-minded look because we’re looking to go out there and win. 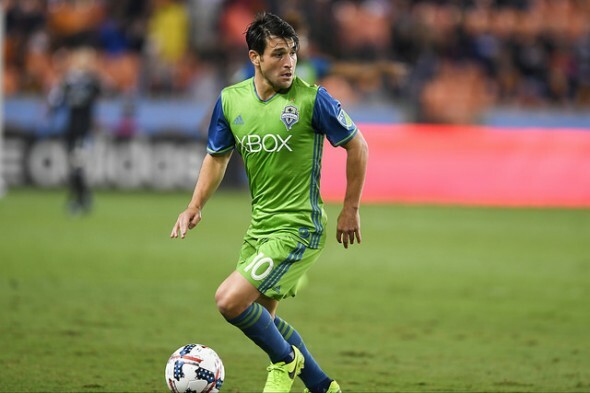 Lodeiro had a chance in stoppage time as he pushed forward for one final attack. Despite having left back Joevin Jones open on the flank for an outlet pass, Lodeiro attempted a low-percentage, long-range effort that swung well wide of the net. Seattle proved it had the grit to score a late game-winner Saturday, but has yet to demonstrate it has the capability to defend a lead. If you’re going to concede late, far better to end up with a draw than a loss. Still, it’s frustrating that the rare defensive misstep cost them the goal. Let’s see if Torres can get back soon and how they can rebound against new-look LA.